On 7 December 2016 professor of Wind Energy Gijs van Kuik gave his farewell speech titled 'Wind verwacht: zet je schrap' ('Wind expected: brace yourself') in de Aula (Auditorium) of TU Delft. During his nearly forty year career, Gijs van Kuik has worked all over the Netherlands but he has started and will end his career at TU Delft. "It is my university," he says. But he soon returned to his studies and, after graduation, he began working in the newly formed wind energy consortium under the tutelage of Theo van Holten. “I was in the right place at the right time,” says van Kuik. The oil shocks in the 1970s brought about an interest in what we now call renewable energies but were then referred to as alternative energies. However it wasn’t long before a PhD position at TU Eindhoven called him to leave Delft. He completed his PhD in 1991 and he wondered, as many recently matriculated PhDs do, if there was life afterwards. Fortunately for van Kuik, there was. He spent nearly fifteen years working in industry before returning to academia and TU Delft. In fact, for several years prior to returning to the university full time he was working simultaneously at TU Delft and Stork Product Engineering. 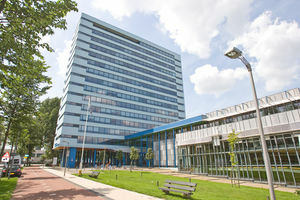 But ultimately, two agendas proved to be too much and he decided to make TU Delft his full time home. His research while at the university has focused on the development of rotor technology for use in wind turbines. The goal of which was, according to van Kuik, “to build more intelligence into the rotor.” Wind turbines, especially those off shore, are tremendously difficult to access and improvements in their longevity can reduce the cost of maintenance. Van Kuik had the opportunity to see for himself just how difficult maintenance can be when he spent time in the nacelles of some turbine prototypes while checking certification processes. “I was much younger than,” he says of his time climbing the sixty metre high structures. 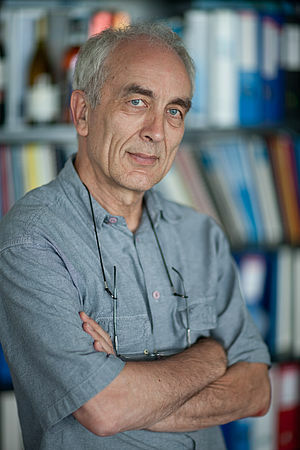 Although this research may have predominantly focused on wind turbine technology, van Kuik has had a few pet research projects over the years, including a nearly decade long quest to see a Russian scientist rightly credited for discovering a constant foundational to aerodynamics. Betz’s Law, so named for German physicist Albert Betz, shows the maximum power that can be extracted from the wind. Van Kuik thought that the law had been discovered at the same time by a Russian scientist, Nikolay Zhukowsky, and, after years of digging through Russian scientific texts, was able to prove Zhukowsky had published the law the same year as Betz. Van Kuik does not speak or read Russian and could only read the maths in the articles but that was sufficient to credit Zhukowsky with the discovery as well. During his tenure at the university, he has served as the scientific director of DUWIND, a multidisciplinary research institute focussed on wind energy. Interest in wind energy has increased dramatically, At his start the introductory wind energy course would see 5-10 students per semester. Now that course attracts over 200 students. Van Kuik plans to spend his retirement, in part, sculpting. He’s been sculpting since 2001 and got into the craft after deciding he needed to do something different from his everyday work. He wanted to do something with his hands, took a sculpting course and has been creating the large stone creations ever since. He’s even given one to the Faculty of Aerospace Engineering which was unveiled in October 2016. “It was a huge thing and someone must have it. There isn’t a better place for this one than the Faculty,” he says of the work which now sits in the lobby of the faculty building.